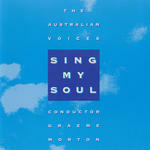 Sing my soul / The Australian Voices ; conductor: Graeme Morton. Voyage / St Peters Chorale. 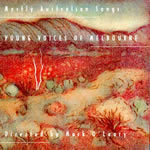 Mostly Australian songs / Young Voices of Melbourne ; [directed by] Mark O'Leary. Voices of a land (SATB and piano) : three Australian songs for voices and piano or orchestra / by Stephen Leek. Voices of a land : three Australian songs for young voices and piano or orchestra / by Stephen Leek. Voices of a land : for voices and orchestra / by Stephen Leek. Voices of a land : for SAB choir and piano / by Stephen Leek. 9 Jun 2013: at Brisbane Chamber Choir (St John's Cathedral, Brisbane). Featuring Brisbane Chamber Choir. 25 Jul 09: featuring National Boys Choir of Australia. 25 Jul 2009: at Lost to the Music - National Boys Choir (Melbourne Recital Centre, Elisabeth Murdoch Hall). Featuring National Boys Choir of Australia.